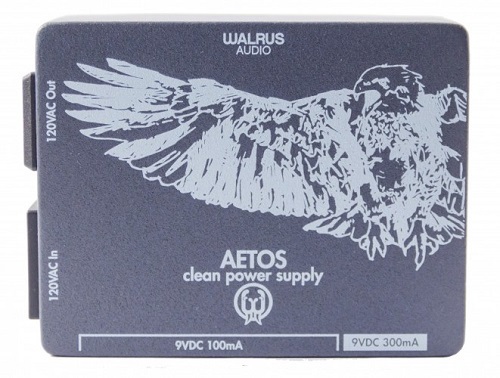 The Walrus Audio Aetos is an 8-output, isolated power supply, utilizing an internal custom wound toroidal transformer to provide the highest noise filtering and cleanest power, giving artists the purest sound in their signal chain. The Aetos is housed in a solid die cast enclosure and is 4.7”long x 3.7” wide x 2” height and has 8 total 9VDC outputs, 6 are 100mA and 2 outputs are high current outputs (300mA) for higher current drawing pedals like line 6 DL series modelers, the Boss Twin Series Pedals and many digital modulation pedals on the market. It comes with a detachable 120V AC Power cord and also has a 120VAC complimentary power output. This unit comes with 8 – 2.1mm barrel black power cables and 2 black-to-red (Line 6) power cables. Fits under most pedal boards including Pedaltrain (PT JR and up), Pedal Pad, Blackbird Boards, Creation Music Company, and Holeyboards.